This is about as basic a meal as we get around here. Easy, simple, my kids love it and I almost always have all the ingredients on hand. Of course, use whatever veggies you like, broccoli just took over as the vegetable of choice when my Sprouts were younger; sometimes dinner wasn't worth forcing them to take another bite of dreaded carrots, mushrooms or squash. Now, thankfully, they like pretty much everything, but they still ask for this combo fairly often. Serve it with rice, noodles, miso soup or pot stickers. Cut tofu into small cubes, about the size of a sugar cube, sprinkle lightly with soy sauce. Stick in a ziploc bag with the cornstarch and toss until coated, remove from bag, shaking off any excess. Fry in a shallow layer of peanut oil: To fry - Heat oil in pan (I like a non-stick, but use what you like) add 1 layer of tofu cubes without overcrowding, let sit in hot oil for a few minutes to develop a 'crust' and then turn carefully. Do a couple more turns, waiting a couple minutes in between sides, until crisp and very slightly browned (light tannish). Remove to a paper-toel to drain. This process is MUCH easier than it sounds. Repeat until all tofu is browned. PREPARE BROCCOLI: Wipe excess oil from pan. Add brocolli and quickly stir-fry with a few dops oil and soy sauce until bright green and tender crisp (or to your liking). Add tofu back to pan with broccoli, and carefully add peanut sauce to your preference (we prefer a light coating, some people like it swimming in sauce). Stir carefully to heat thru, another minute or two and serve, sprinkled with sesame seeds. Mix together. If too thick, add water or apple juice to thin to your preference. This can also be whizzed up in your food processer. Definitely going to try this one! I have all of the ingredients. Thanks! Yum! 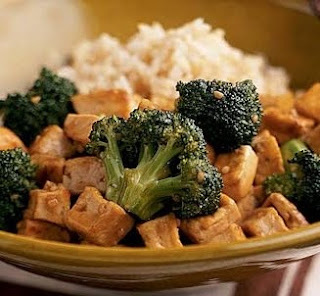 Tofu with broccoli in peanut sauce is one of my favorites. Thanks for posting the recipe! Looks delicious! And I just bought a bottle of peanut sauce on sale at my local grocery store. I think I'll follow your advice and use the bottled stuff! I made this tonight! :-) It was really, really good!!! I am going to blog about it later with of course links to your blog. Thank you so much!!! Yum, I'll have to try your cornstarch trick! looks great! I've been eating lots of stir fry's lately. I just love them.